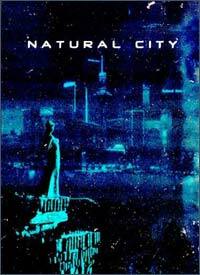 My first movie date of the 2004 Seattle Film Fest was Natural City, and for a punked out girl from the future, she was a real bore. 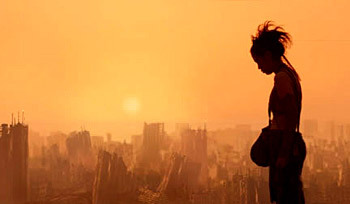 A mess of a sci-fi movie set in 2080 A.D. Agent R is an MP responsible for hunting down rogue cyborgs, but his heart is occupied with a female cyborg night club dancer who's about to expire. Meanwhile, one particular rogue cyborg is causing all sorts of problems from the police. Will Agent R get his head together in time to prevent a nefarious plot from unfolding? South Korea's movie industry is booming in output, but recent entries I've seen like this movie and Tube resemble Frankenstinian collages of American movie cliches. The visuals in Natural City are sufficiently impressive, but Blade Runner came out in 1982, and this movie doesn't even match it. The movie needs some serious editing, and the screenplay is crippled by its failure to explain why R cares so much for a cyborg that has the personality of, well, a cyborg. Much of the rest of the plot is murky, leaving me and the rest of the audience tapping our toes until the next appearance of the spinning, jumping cyborg killers. It's not a compliment when the most compelling characters in a human drama are the robots. I'd love to see South Korean cinema focus on telling stories from its own culture or milieu, stories inspired by its country and environment, such as Joint Security Area by my favorite South Korean director, Chan-Wook Park. His Old Boy won the Grand Jury Prize at this year's Cannes Film Festival. The more money Korea spends on its movies, the more unoriginal they turn out. Hey, that sounds like Hollywood.